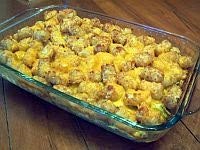 Tater Tot Casserole isn't the most gourmet of meals; however, it's quick, easy, inexpensive, filling, and the kids love it. In fact, it's the only way I can get 2 of the 4 kids to eat broccoli without complaining. 1. Cook the tater tots in the casserole dish in the oven at the temperature on the bag and for the correct time. 2. While the tater tots are cooking, cook the hamburger with the onion and garlic. I always like to salt and pepper the meat too. Steam the broccoli as the meat is cooking. 3. After the meat, tater tots and broccoli are done, drop the oven temperature to 350. 4. Mix together the milk and the cream of celery soup. 5. Place the steamed broccoli on top of the tater tots. Next, add the hamburger and pour the soup/milk mixture evenly over the top. Sprinkle the shredded Colby cheese on top. 6. Cook in the oven for 10-15 minutes. Remove and add the fried onions to the top and cook an additional 5 minutes. I've seen a lot of variations to the Tater Tot Casserole recipe, but this is the one we enjoy. What variations do you add to your tater tot casserole?